This community event is organised by Sustrans, promoting sustainable transport, in collaboration with CICCIC and is a FREE EVENT – but you must book a place on one of the times below. Kids! 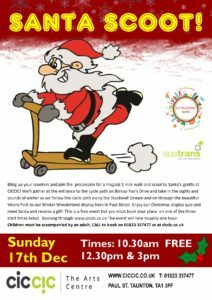 Bling up your scooters and join the gang for a magical walk and scoot to Santa’s grotto at CICCIC in Paul Street! We’ll gather at the entrance to the cycle path on Bishop Fox’s Drive and take in the sights and sounds of winter as we follow the cycle path along the Stockwell Stream and on through the beautiful Vivary Park. When the group arrives at CICCIC the children will have a chance to make some final touches to their scooter decorations before Santa arrives to inspect their handiwork. He’ll be awarding prizes for the best decorated scooter and all children will receive a small gift. After meeting Santa children can have a go at a special grotto quiz while adults can grab themselves a coffee and a mince pie from the bar. Note: The event starts at the entrance to the cycle path on Bishop Fox’s Drive and proceeds from there to CICCIC! So that’s where you need to be at the chosen time – not at CICCIC. Walk/scoot leaves at 10.30am, 12.30pm and 3pm. Please arrive at least 10 minutes before. The route is 1 mile long (approx 20-25 minutes). We keenly encourage the use of public transport to the start of the route. The number 6 bus stops outside Richard Huish College (South Road) and leaves every half an hour from Taunton Parade.